It has recently come to our attention that the Union Flag Faststamp in the Bureau pack has been reprinted with a different font and layout. As far as I can see, there is no change to the carrier in the pack. The original is shown above the current version. The content of the datastring and service indicator is the same, but the second line is now left-justified in line with the first line. In addition the shape of the lettering of 1st Class up to 100g is much different, and there are slight changes to the shape of the digits in the datastring. It seems that the first type also exists with the text spacing from the left margin varying considerably, but otherwise the same. In the original pack, issued on 21 May 2012, the printing is the same as that on stamps in the Farm Animals packs. This format continued until the Symbolic Flowers pack of September 2014 on which the printing has the same characteristics as the lower stamp shown above. The new pack is on sale here. 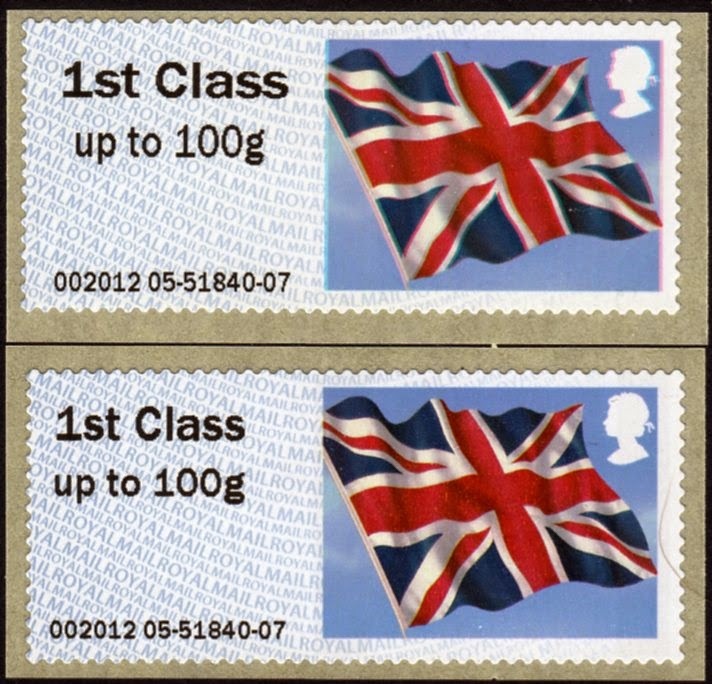 These packs with the Union Flag stamp in are no longer on the Royal Mail's online shop. Royal Mail Philatelic Bureau,Edinburgh Still have this Pack on sale for Telephone orders,and are listed in February's Stock List.